For centuries "Skål" has been exclaimed in Swedish gatherings from midsummer nights to smorgasbords. These are joyous celebrations where everyone is invited to toast and express their gratitude for the moment through speech, song or simply a warm exchange of eye contact with all those at the table. 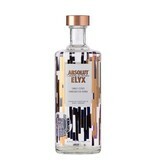 This tradition embodies all that is special about the Absolut Elyx: hospitality, integrity, warmth, playfulness, style and of course, Swedishness.